The Silicon Precursor Quality Control Test Sample Manufacturing System (SiQC) is designed to grow ultra-high-purity (intrinsic) monocrystalline silicon layers on a monocrystalline silicon substrate for qualifying feedstock for Polysilicon manufacturing facilities. 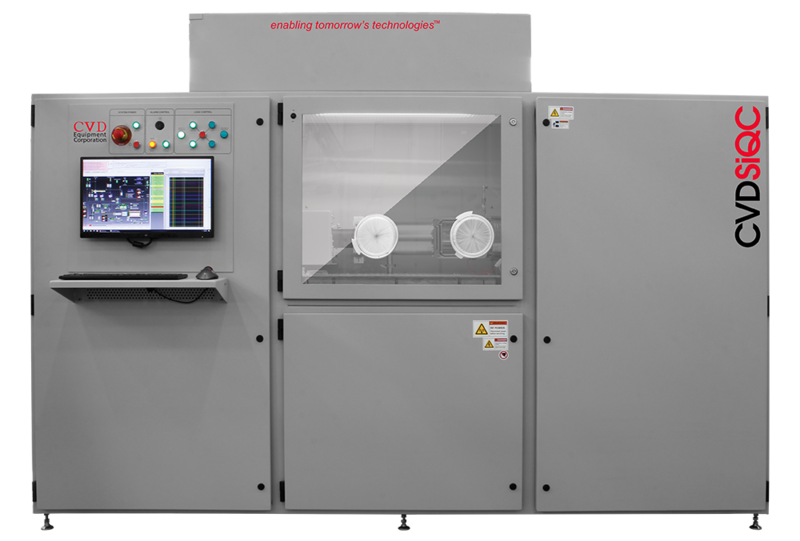 Our SiQC system provides optimum control over Silicon epitaxial thick film grown on processing of float zone (FZ) wafers. A water cooled, high purity quartz process tube is provided to minimize tube deposits by keeping the quartz tube cool even during long deposition runs. Minimum tube deposits allow more runs between tube cleanings. Continuous Chlorosilane Feed Option (DCS,TCS,SiCl4), including liquid feed/drain, UHP Argon purge feed line, liquid flow controller, vaporizer and sample/UHP Argon purge line (vent to scrubber). Allows for real time characterization of liquid precursor material by sampling the feedstock continuously. Continuous Silane Feed Option allows for realtime characterization of gaseous silane by sampling the feedstock continuously.